Let me start off by saying I don’t want to see a UFO. I want to see something that’s obviously not just a light in the sky or could just be a plane/helicopter/swamp gas/flock of flying monkeys. Although now that I’ve said it out loud, flying monkeys would be a-okay. And I wouldn’t mind seeing the ol’ swamp gas for myself. Maybe it was having a dad who loved science fiction, or burying myself in goofy yet sometimes terrifying UFO comic books when I was a pup. 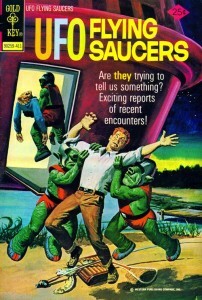 But throughout my entire life, I’ve been fascinated by the subject of flying saucers. 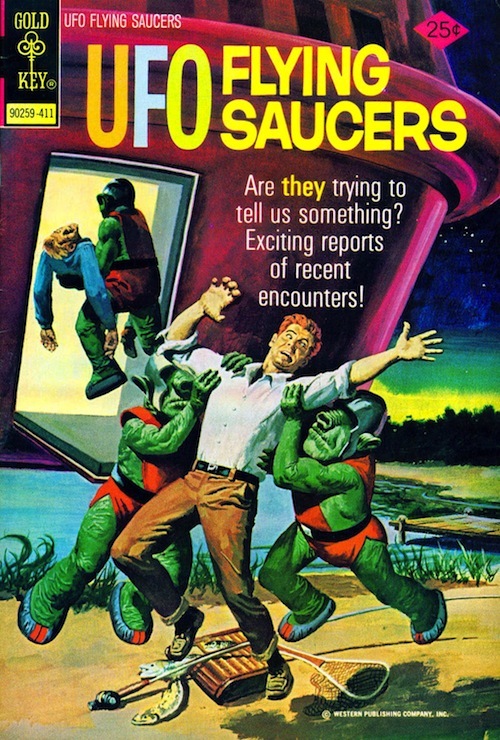 I’m sure it’s not cool to call them that nowadays, at least not in UFOlogical (does that word even make sense?) circles, but let’s face it: most of the good ones tend to be saucer-shaped. I should state right now, I’m firmly in the middle of the road when it comes to UFOlogy, Cryptozoology and what have you. 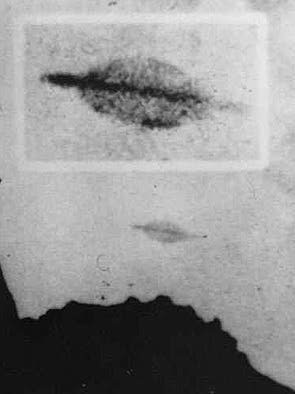 I don’t wave the UFO flag and buy into every story that comes down the pike, but I don’t disbelieve, either. Like the poster in Fox Mulder’s office says, I Want To Believe. When Steven Spielberg’s classic Close Encounters of the Third Kind (1977) was released, me and my dad were there on opening night. I joined the CE3K Skywatchers Society, and if I could find the newsletters and membership packet, I’d scan ’em and post them here, but that stuff (and lots of other cool things from my youth) seems to have disappeared into my family’s version of the warehouse at the end of Raiders of the Lost Ark. 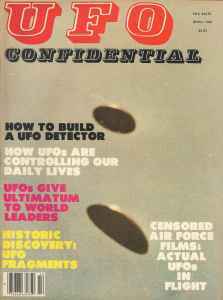 I used to gobble up all the lurid UFO magazines I could find, even though they scared the hell out of me a lot of the time. And of course I watched all the movies and TV shows on the subject that hit the airwaves (which sometimes meant staying up half the night back in the days before VCRs, but that’s the stuff of another post). But I’ve never seen a UFO for myself. Not even a mysterious light. 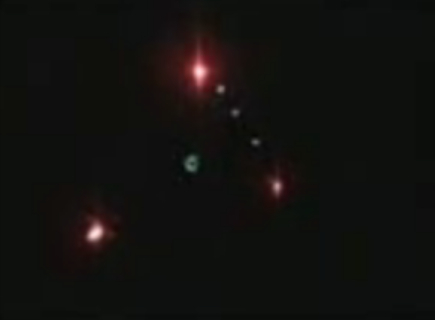 Anything I’ve seen in the sky was easily identifiable or readily apparent as a plane or balloon or whatever the hell. And dammit, I think I’m about due. It’s fairly common knowledge that fellow Cheese Magneteer ScottD is my neighbor, on a shared property in a semi-rural area (as Don Adams says, I live in the gift shop for ScottD’s house). Sometimes we stumble across each other in the yard, in the night. And both of us are invariably staring up at the sky. We even have a code phrase ready to go in case one of us is outside and spots something — we’ve made a sacred pact that whoever sees it will alert the other one, because ScottD feels much like I do about this whole thing. We want to see a UFO. And you’d think we live in the perfect spot for it. There are times where Decker, the Chihuahua, wakes me up at 4:00 AM and desperately needs to go out. Now, I don’t like to get outta bed at that hour and I don’t like to be outside in the dark all that much because who knows what the heck might be lurking out there, but when I take that little dog out in the middle of the night, I keep my eyes peeled, and I’m always ready to bang on ScottD’s bedroom window and yelp the code phrase (which shall remain our secret in order to prevent pranksters from pulling false alarms on us). I don’t feel like I’m asking for a lot. 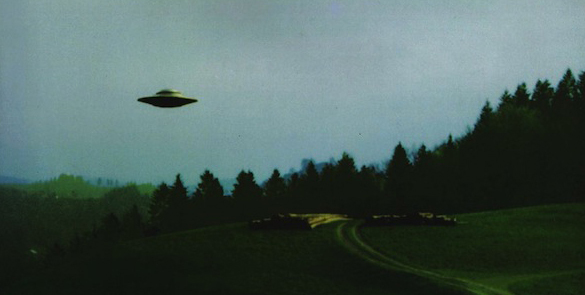 I don’t need to be abducted or see something parked in the field next door with little grey fellows scampering about. I don’t want a crazy beam of light to lift me into the air (especially while I”m walking the Chihuahua), and after years of working in Hollywood, I sure as hell don’t want to be probed. Admittedly, it would be kind of cool to be drafted into the Green Lanterns Corps (or even the less-impressive Nova Corps), but how often does that happen? But I would like to see something that is without doubt not an airplane, not a satellite, not a fat guy carried aloft by balloons. I want to see a classic saucer. I’d settle for a slow-moving black triangle, even. I don’t have to know for sure it’s from another world, or another dimension, or from the Nazi base in the hollow Earth. But I want to know I’ve seen something crazy as all hell. And then I’ll pound on ScottD’s window, holler the code phrase, and run around the yard squealing like a schoolgirl. How about you, dear reader? Hit the comments section and tell us about anything funky you’ve seen in the sky.